The Cathedral’s remotest precedent was a small 1st-century Roman mausoleum, where the remains of the Apostle James Apostle James were buried, after he was beheaded in Palestine (44 AD) and brought by sea to the coast of this Land’s End. During centuries, the underground chamber and surrounding cemetery were regularly visited by a small local Christian community, of which little or nothing is known, but which must have disappeared around the 8th century. In the year 813 (820 or 830, according to other versions), the Apostle’s relics were miraculously discovered among the undergrowth on Monte Libredón. They were found by a hermit that saw signs in the heavens. After being informed by the bishop of Iria Flavia, the Asturian king Alfonso II ordered a small stone-and-clay chapel to be erected beside the ancient mausoleum. In the year 834, this church received a royal Preceptum, which made it the episcopal see and granted it power over the surrounding territories. The first settlers and groups of Benedictine monks, who were in charge of looking after the relics, began to settle in the surroundings in search of protection. These were the first steps of the future city of Santiago de Compostela. The first church was soon too small to receive all the worshippers. Hence, between 872 and 899, Alfonso III the Great ordered a large church to be built. But this second church was destroyed by the Islamic leader Almanzor in the year 997. The bishop known as San Pedro de Mezonzo rebuilt it in 1003 in pre-Romanesque style. This third church was still standing when the boom of pilgrimages and the riches of Santiago, which was by then one of the largest feudal domains in the Iberian Peninsula, enabled the construction in 1075 of the Romanesque Cathedral that exists today, the fourth sacred building on the site of the ancient tomb. 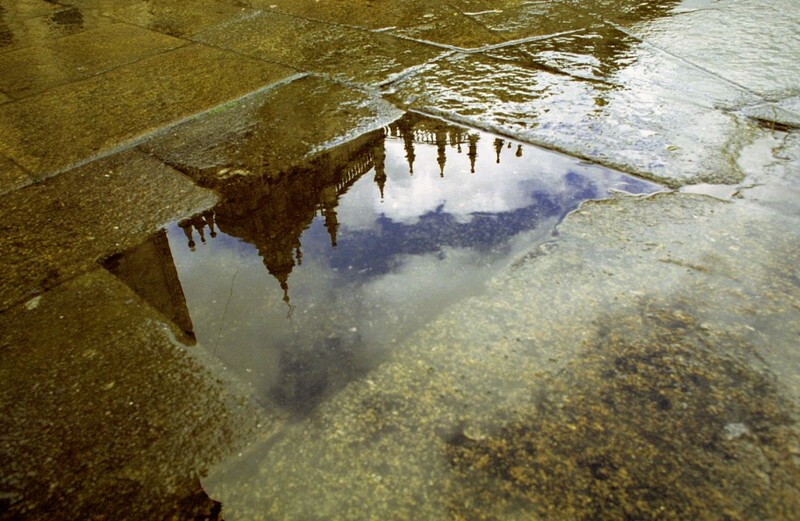 The king of León, Alfonso VI, and especially the city’s first archbishop, Diego Gelmírez, promoted the Cathedral, city life and pilgrimages to such an extent, that the 12th century can be said to be the most glorious in Compostela’s history. This time they were not satisfied with a a sanctuary for housing the relics, but designed a large pilgrimage cathedral, following the style that had been spread by the Way of St. James. It was visited by the best builders of the Romanesque era until the arrival of Maestro Mateo, who designed the final sections of the naves, the defensive towers in the west, the crypt and, above all, the “Pórtico de la Gloria,” a series of sculptures unequalled in Europe that now dominates the west entrance. By the time it was dedicated in 1211, the Cathedral enjoyed the privilege of plenary absolution, granted in 1181 by Pope Alexander III to everyone visiting the church during a Holy Year. A valuable document was also granted to pilgrims, certifying having completed the Way of St. James and guaranteeing the right to asylum in the city. Converted into the destination of salvation for Christendom, the Cathedral evolved with such force that it was capable of stimulating the construction of roads, hospitals, shelters, markets and entire towns hundreds of kilometres away, along the routes travelled by pilgrims to reach it. In time, Gothic, Renaissance and especially baroque elements were gradually added to the Romanesque ground plan, thanks to the incessant influx of money from the archbishopric and patrons, who found a place for prayer and eternal rest in the chapels. While the structure of the naves has remained practically the same, the number and space of the chapels gradually adapted to the needs of worship. In the convulsive 14th century, the basilica acquired a fort-like appearance, with defensive towers such as the present-day Clock Tower. With the Renaissance, promoted by Archbishop Alfonso III de Fonseca, the final cloister was erected, which replaced the Romanesque cloister and modified the church’s entire south and southeast side. This was a time of internal alterations and addition of altarpieces, pulpits and sculptors for the greater glory of the worship of the apostle. The greatest aesthetic revolution would reach the church during the baroque period, which began in 1660 by transforming the high altar and dome; thereafter giving shape to the organs, designing the wall featuring the Holy Door, embellishing the Clock Tower and attaining its greatest splendour with the culmination, in 1750, of the Cathedral’s most iconic image: its magnificent Obradoiro façade. After two thousand years of history as a spiritual centre, and almost a thousand years of its present-day building, the Cathedral is now a heterogeneous complex of aesthetic spaces and elements that allow us to “read,” in its stone, the extraordinary history of Compostela. And the fact is that during its long existence, the church has been the setting of all kinds of sacred and mundane episodes, ranging from the crowning of Galician kings in the Middle Ages to the garrisoning of French troops during the War of Spanish Independence, passing through centuries of agreements and disagreements, exaltations and lynchings, political conspiracies and religious splendour, incendiary attacks and costly beautification campaigns, pomp and charity, donations and plundering, receipt of prebends and patronages, solemn offerings and, above all, incessant pilgrimages to the apostle’s tomb.